Wow, I am so far behind. I have a lot of updating to do. Robby had a ton of activities, for the end of the school year, I need to blog about, baseball season has started, and summer activities have all begun. We just got back a couple of days ago from Disneyland, and I probably better start my updated by blogging about that. As usual, I took a lot of pictures. I will be posting them, as well as a little report of our trip, over the next couple of days. For tonight, I will just post one picture. 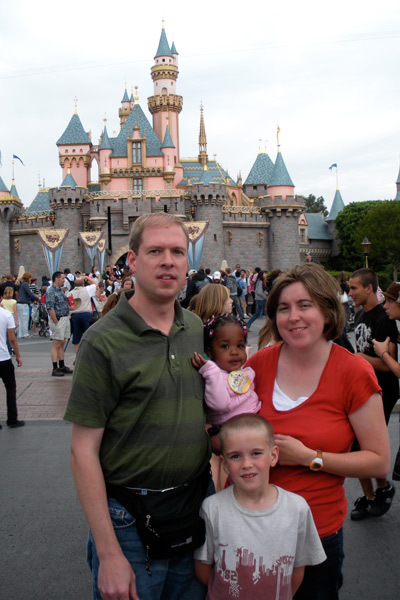 Here we are, as a family, at the Happiest Place on Earth. Don't we all just look thrilled to be there. Note to self: next time take this picture on the first day, not on the last one, just as we are leaving the park. We were all exhausted and ready to go home. Despite how we look in the picture though, we all had a really good time. I love Disneyland, especially with the kids. It is just so magical. Yep, you all looked tuckered out...it looks like you DID have too much fun without us. Gavin and I loved going there for our Honeymoon! You and Kirk will love going with just the two of you. It's always got to be fun with the kids, but it's nice to enjoy "The Magical World of Disney" with just the two of you. Hope you enjoy it then as much as you did this time!! !